Obviously, there will be spoilers about City of Bones. You’ve been warned. 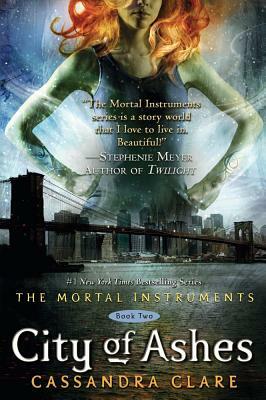 Clary’s world has turned upside down: her father (previously thought dead) is an ego-maniacal super villain; she’s kind of in love with her brother (whom she didn’t know existed); and she’s discovered that she’s a part of this whole community of Shadowhunters, and that demons, fairies, vampires, and werewolves are real. It’s not an easy transition to make when two weeks ago your biggest concern was normal high school stuff. To make matters worse: Valentine has the Cup and is going after the Shadow Sword to raise a demon army, and the Clave won’t listen to Jace about it. Things are not looking good. Much like City of Bones, I fell head first into this world, and thoroughly enjoyed my time there. Mostly because there is SO much to enjoy. The characters — Clary is a spitfire, and Magnus is awesome, and Simon is amazing (and I’m loving what Clare is doing with his character. The humor is fantastic, and the world-building fabulous. I’m loving all the twists and turns and sometimes painfully slow reveals. I’m more than curious to see where she goes in the next one, but much of that is because M read City of Glass and said it’s her favorite one by far. You’ve got to love a series where the books just get better. And this is definitely one of those series. Thanks for the review! I will have to check this series out! love this series. When you finish this, you have to read the Clockwork Angel by Clare. I think it is better if that is possible.